A judge sentenced former Donald Trump presidential campaign manager Paul Manafort today to 47 months in jail, which adds up to almost four years of incarceration. Manafort faced the possibility of up to nearly 25 years, based on federal sentencing guidelines. He will receive credit for 9 months of time already served. Paul Manafort had previously been convicted by a jury on eight charges: 5 counts of tax fraud, 2 counts of bank fraud, and one count of failure to disclose a foreign bank account. NOTE: In a separate trial, Manafort is scheduled to be sentenced for other crimes in DC next week. Before issuing the sentence, Judge T.S. 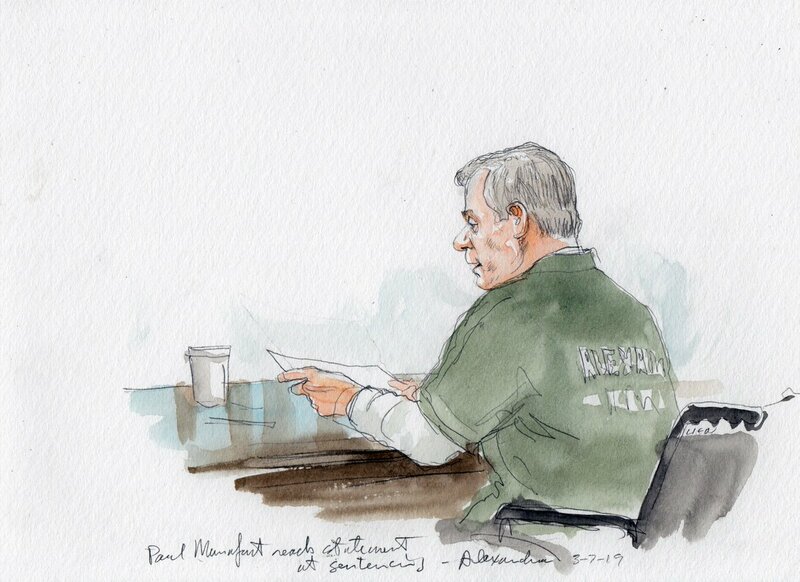 Ellis said the sentencing range for Paul Manafort of 19-24 years is “excessive,” noted he "lived an otherwise blameless life," was a good friend and generous person to others. “That doesn't erase his crimes however,” Judge Ellis said. “The real essence of his violation is that he stole from us, the people who pay their taxes,” Judge Ellis says of Manafort. Manafort entered the court in a wheelchair, and used a cane in the courtroom. He spoke before the judge for about four minutes at the end of the trial, before the judge issued his sentence. Prior to sentencing, the judge said Manafort would get no credit for accepting responsibility for his crimes. Manafort got away with lucrative crimes around the world for decades. The mistake that did him in? Nothing more to say except now it is time "To Make America Great Again"! Mr. Manafort’s lawyers repeatedly implied that the special counsel’s office pursued their client with unusual vigor because of his importance to the Russia inquiry. They said his political consulting work for four American presidents, including Mr. Trump, spoke to his high ideals. And they argued that the special counsel’s office has vilified him for what are essentially garden-variety crimes that for other defendants merited only limited time behind bars. But prosecutors said that Mr. Manafort had been under criminal investigation before Mr. Mueller was appointed in May 2017, that his fraud scheme lasted a full decade and that he committed new crimes by tampering with witnesses after he was indicted. Those new offenses led a federal judge to revoke his bail and jail him in June. By comparison, a woman that voted accidentally got 5 years. Mueller’s team says Manafort never gave meaningful help. The judge noted he spent 50 hours with prosecutors. "It wasn't information we didn't know," the prosecutor said, raising his voice. "The reason he met for 50 hours was because he lied." Manafort is now addressing the Court: he states that he is “humiliated and shunned”. He did not apologize and complained about his situation. He asked for compassion from the Court. Does not sound like he is expressing remorse for his conduct. Judge Ellis calls #Manafort‘s guidelines range “quite high.“ The guidelines are based on data from other cases, and are high here only because the conduct was so egregious. Why are the guidelines considered too high only when the defendant is wealthy and powerful? Manafort spoke briefly about how prayer and faith have helped get him through this time. "I ask you to be compassionate," said Manafort. Manafort’s judge took the opportunity of having a full courtroom and the media watching to describe other cases where he's given sentences he intended would deter others contemplating crimes. He added that "they hung pickpockets" in England centuries ago. The judge says Manafort gets no credit for accepting responsibility for his crimes. Court is now taking a brief recess before final arguments and the announcement of the sentence. Manafort also never provided extensive financial information to the Virginia federal court so probation officers could calculate his full worth, Asonye said. Well, Trump should appreciate this. The judge in the Paul Manafort case said, besides committing multiple felonies, he "lived an otherwise blameless life"
Manafort, his fortune depleted and his health deteriorating, appeared in court today in a wheelchair. Judge Ellis: "Manafort led a blameless life before this." This is the man who whitewashed the blood spilled by Mobutu, Jonas Savimbi, and the Marcos family. Judge Ellis last year: "You don't really care about Mr. Manafort's bank fraud. ... What you really care about is what information Mr. Manafort could give you that would reflect on Mr. Trump or lead to his prosecution or impeachment." Guys JUDGES MATTER and this is why it's a super bad slow burning awful thing that Trump is stacking the courts?